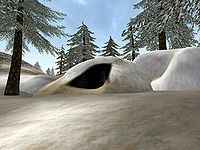 Gronn is a system of ice caves located southwest of Lake Fjalding on the Isinfier Plains. Gronn possibly contains the largest amount of berserkers on Solstheim. Close to a dozen berserkers call the caves home, including the supposed leader of them all: the Berserker Denmother. The caves contain various items of minor value, a large amount of mead and the unique Helmet of Bearkind, which is found on the Denmother's body. This page was last modified on 12 November 2013, at 02:05.